By happenstance, he discovers a trade that suits him and a path to learn it well. Jackson Oloya enjoys working with his hands and learning something new every day. 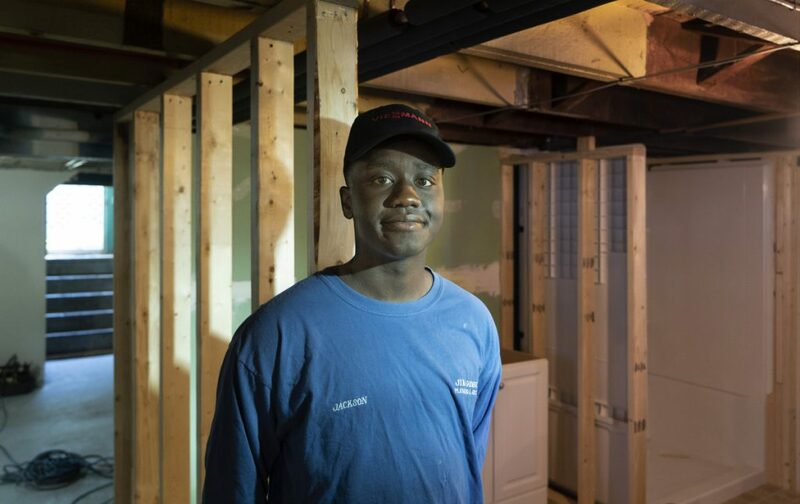 But most of all, as a plumber apprentice learning his trade through the Biddeford Regional Center of Technology, Oloya finds great satisfaction in doing good work. As Oloya graduates from Biddeford High School, he already has a job working for Jim Godbout, his mentor and employer since last year. Under a paid internship, Oloya worked for Godbout every weekday morning and attended classes at the high school each afternoon. Once Oloya completes 4,000 hours of on-the-job training, he can take a test for Maine’s journeyman plumber license, according to the state’s website. After working an additional 2,000 hours as a journeyman plumber, he can take a test to become a master plumber. Plumbers in Maine earn an average of $50,000 annually, according to the U.S. Department of Labor. One of 11 siblings, Oloya and his family came to the United States from Uganda when he was 3 years old. They lived in New York and Texas before settling in Maine. He discovered his career last year, almost by accident. Oloya acknowledged that plumbing can be a dirty, smelly job sometimes. One recent morning, Oloya helped a master plumber convert a residential heating system from propane to natural gas. Next time, Oloya will get to do more of the job himself. Oloya credits his family, friends and co-workers with helping him succeed, especially Godbout.